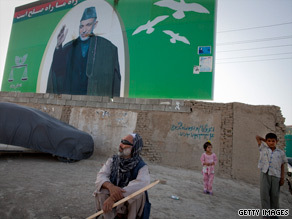 President Hamid Karzai continues to maintain a strong lead in last month’s presidential election but needs more votes to avoid a runoff, according to partial results issued by Afghan election officials on Wednesday. Karzai is the choice on 47.28 percent of the ballots counted so far and his closest challenger, Abdullah Abdullah, is at 32.57 percent, Afghanistan’s Independent Election Commission said. The tallies were from 60 percent of the country’s polling stations. Final election results are expected sometime in September. Candidates must get 50 percent of the vote to avoid a runoff. If no candidate wins an absolute majority, there will be a runoff between the top two contenders, most likely in mid-October. Of the 3,689,715 votes deemed valid, Karzai has received 1,744 428, the commission said. Abdullah has garnered 1,201,838; Ramazan Bashardost is third with 426,331; and Ashraf Ghani has 88,835. Many complaints alleging voter fraud have been filed. Another agency, the Electoral Complaints Commission, said that before the results of the August 20 vote can be certified, it must resolve the complaints it has received. The vote count — like the election itself — is taking place in the shadow of persistent violence, with militant attacks and fighting between NATO-led forces and the Taliban. On Wednesday a suicide attack in Laghman province killed the deputy director of Afghanistan’s intelligence service and 22 others, an official said. Abdullah Laghmani was with the National Directorate of Security, an Afghan agency that serves a role similar to that of a combined CIA and FBI. The strike targeted Laghmani and other officials who were visiting a mosque, said Sayd Ahmad Safi, representative of the provincial governor’s office. Another 35 people, including children, were wounded, he said.